Which Type of Journaler are You? I like to break down journaling into 3 styles: The Writer, The Doodler, The Painter. You should feel free to journal to your strengths! And if you haven't chosen your actual journal yet, here's a post about how to find the perfect one! As we approach the summer solstice and new moon on the 24th, this is a great time to start your journal! You might be the Writer type if you feel WAY more comfortable jotting down your thoughts, ideas, stories, poems, and/or lists into your journal than adding any fancy drawings or paintings to your pages. Take it to the next level: If you want to add some flair to your journal, consider learning some new handwriting styles or purchasing some fill-in-the-blank style journals! You may want to totally wild with some stickers or stamps! Somewhere between the Writer and the Painter is the Doodler. Your journal may be a mix of written words and small drawings. 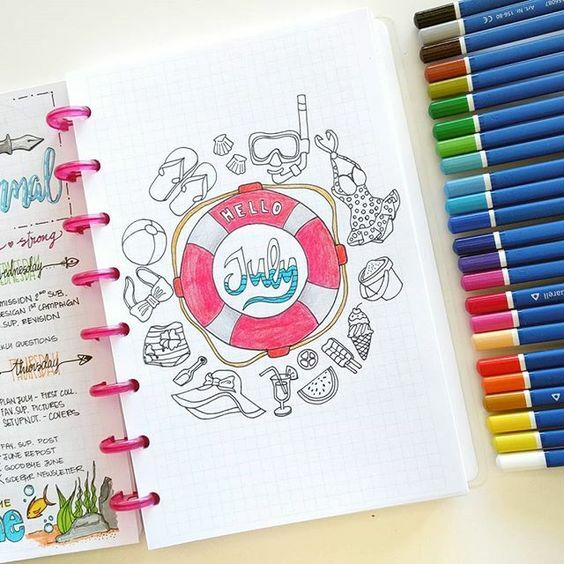 Doodlers have a knack for finding the perfect little graphic to drop into their pages and build beautiful text layouts around to surround them. Take it to the next level: Your journal is probably already pretty flaired out! But you may consider dedicating one full page to your beautiful artwork. Consider doing some street sketching and watercolors! We all know the Painter type -- gorgeous art journal pages popping with color, perfectly-placed sketches, and basically Van-Gogh-style masterpieces all in the confines of one tiny journal page. How do you do it!? Take it down a notch: No, not really -- you do you, artist friends! But, if you want to try some new exercises in writing, consider adding journaling cards or exercise that poetry muscle!